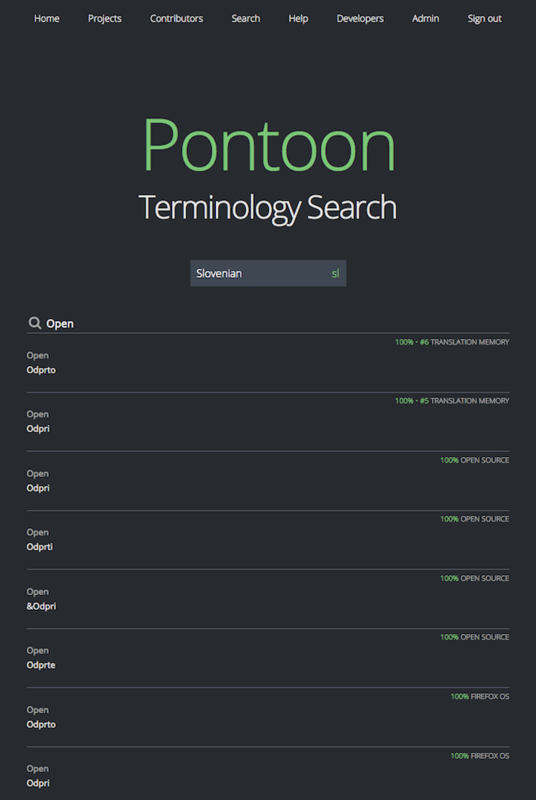 New release of Pontoon is out the door. It’s mostly a bugfix release eliminating annoying glitches like broken contributor profile links. Thank you for your first contribution to Pontoon, Benoit! Some new features are also available, e.g. displaying warnings on unsaved translations as suggested by flod. And — Terminology Search is now also available as a standalone feature, making it easier to access. It works similarly as the Search tab in the out-of-context translation panel. I’m interested in improving the social aspects of Pontoon to do things that we cannot currently do with Verbatim. Basically, be able to find out easily who made a contribution or suggestion and have a means to contact them. That way we could thank them, offer advice on how to improve their contributions and invite them to community events. Benoit, any suggestions and/or patches in that directions are very welcome. Keep them comming!